Let’s face facts – most closet “systems” (if you can call them that) make your goal of a space efficient closet impossible. Many people have a feeble shelf at the top with a slightly bowed rod underneath – or worse yet, a flimsy wire system. These aren’t exactly designed to make your closet efficient and effective. The result – your clothes are cramped and wrinkled. Your shoes are a jumbled mess on the closet floor. What’s even more amazing is I see poorly designed closets installed into new million dollar homes (see the example below from last year’s Columbus Parade of Homes). If your existing closet is an organizational nightmare on Elm St. (or High St.) what can you do to transform this not-so-tidy space (OK – I’m being politically correct here only calling it not-so-tidy)? 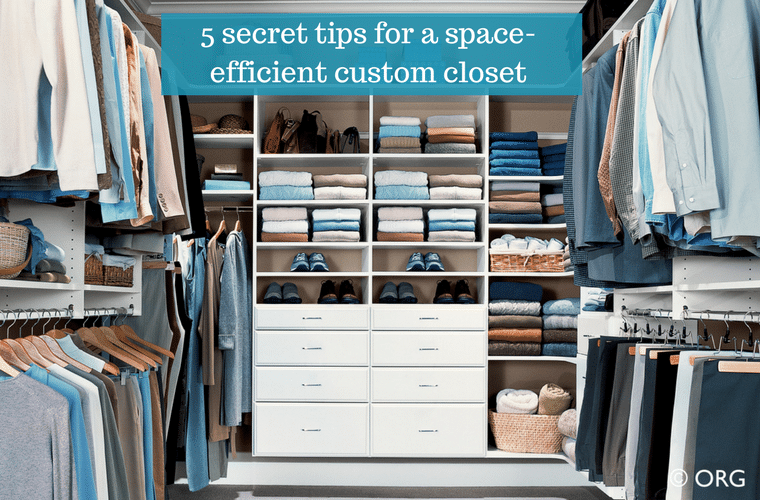 Check out 5 secret space-efficient closet tips below which will help you design a walk in or reach in closet where you’ll actually be able to find your stuff! In life, you’ve learned it’s critical to adjust. You had to bite your lip when your teenage daughter brought home her new boyfriend and let’s just say he wasn’t the clean-cut image of the young men on the Abercrombie and Fitch bags. Then your son tells you he wants to go out for the football team a week after you saw the movie Concussion about head injuries. You don’t want to disappoint him so you say a few more prayers and let him try out for the team. I know after my heart attack I had to make a few more life adjustments (more whole grains in my diet, no coffee – but I’m still not giving up my ice cream!). Your husband is 6’2” and you’re 5’0”. If his hanging sections are designed at the same height as yours, his coats will be wrinkled at the bottom. If your hanging sections are designed for his height, then you’ll have dead space in the shelving below. When you have a vertically adjustable closet you can tailor each section to fit your clothes and height. Your significant other likes to fold his jeans and put them on shelves. You like to hang jeans by the cuff. 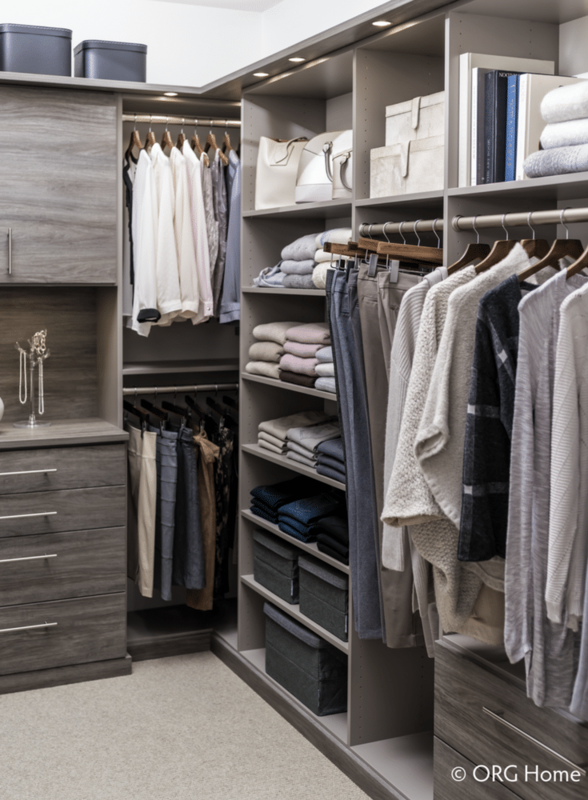 Your custom closet design needs to adjust to include sections for each of your needs. He’ll need shelving, you’ll need hanging space. One size does not fit all! 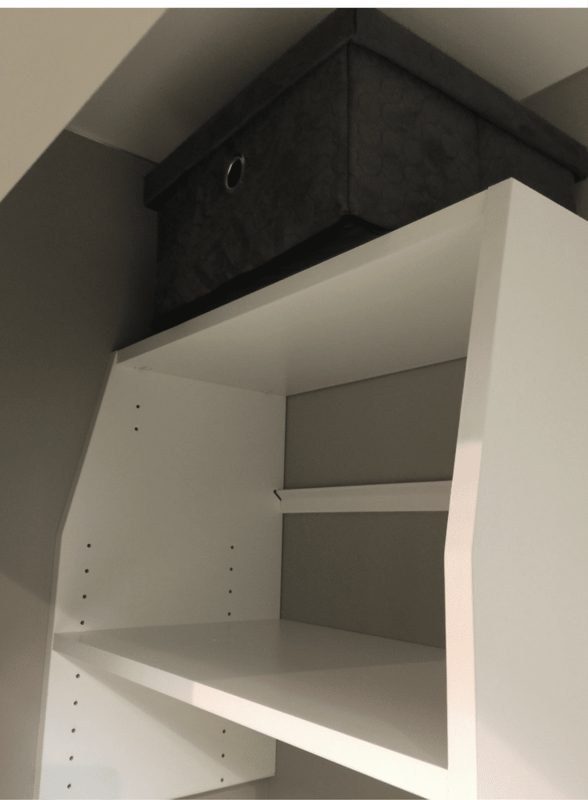 With professionally designed and manufactured closet systems there are holes on the side support sections to give you the ability to adjust your rods and shelves to fit your needs. This creates flexible space which changes with you as your mix of clothing and styles change. You get all geeked-up to fix your poor functioning closet and drive down to your local big box store. You throw some hanging and shelving sections into your cart and drive home on a mission. You’re ready to fix this closet once and for all! You fight through the mass of clothes and measure your closet at 79” wide (you notice you bought 3 – 24” wide sections). It doesn’t take any advanced math to figure out you’re going to end up with 7” of dead space (79” total width –72” sections you have). Oh well (you think), not the end of the world to lose 7”. You press on anyway and start installing. Everything is going well until you get ready to install the second section and realize the access panel for your shower plumbing on the other side of the closet wall is smack dab in the middle of your support section (you didn’t even know this access panel was there because there were so many clothes covering it up). You say a few “choice” words (I won’t repeat them here). You start thinking, closet design is trickier than I thought. 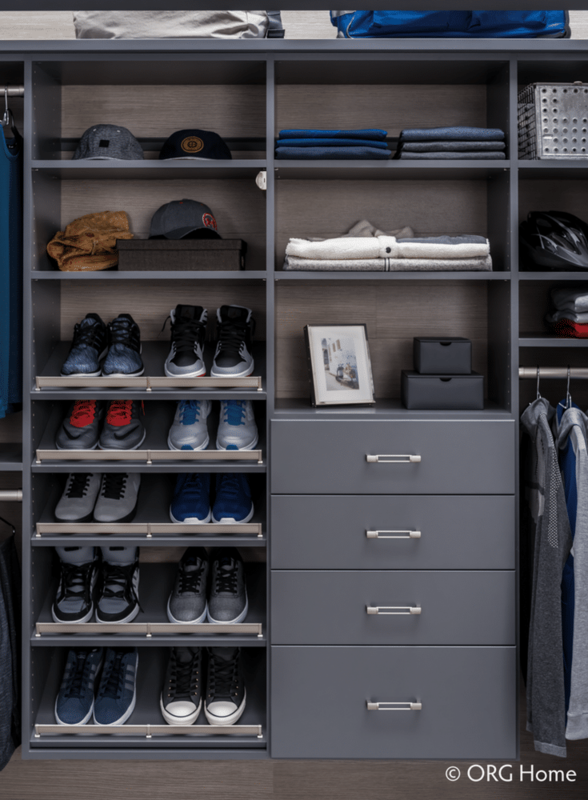 All the installation hassles (and dead space using standard section sizes) above can be eliminated by starting first with a 3D custom closet design. A well-done design will begin by showing all the obstacles (electrical outlets, access panels, light switches etc.) you need to work around. The right design program and closet system will allow for custom sizes so you can create a wall to wall design using all 79” of your space. Nothing wasted at the sides. Closet systems can either be started on the floor with a decorative toe kick or hung from a wall and mounted directly to your studs. While the floor mounted systems look grander, the trim or toe kicks at the bottom will take away 3 to 5” of storage space. The wall mounted system will let you use all of your floor space and can provide a clean, crisp minimalist closet design. Tip #4 – Challenge your assumptions. Determine your best mix of closet hanging, shelving and drawer space. As Satchel Paige (a famous pitcher for the Cleveland Indians) once said, “It’s not what you know, it’s what you know that just ain’t so.” What this means is just because you have a way of doing things today (i.e. using your closet), doesn’t mean this is the best way of storing your clothes and shoes in your future. Let’s apply this quote to an efficient closet design. Today you may be hanging most of your clothes on rods. In many cases this is how you have to do it because you only have a single shelf and rod at the top of your closet. This doesn’t mean this is the most efficient way to design moving forward. While doubling up (in the industry this is called “double hang”) your hanging is a sound strategy, it’s a good idea to step back and re-evaluate the amount of hanging space you need moving forward. How would your thinking change if I told you it’s possible to store 2x as many clothes in a drawer (folded up) as you could get on hangers? In addition, with drawers the closet will look tidier than ever before. I know about the benefits of this from experience. Now, I get 20 running shirts in one drawer vs. having them all y on hangers like I used to have. Ask yourself, could drawers make my closet storage more efficient and provide a less cluttered look vs. all these hangers I’m staring at today? In tip 3 we talked about effectively using the floor of your closet with a wall mounted closet installation, but have you ever looked up in your closet and see a vast wasteland of space you can’t use at the top? Effective closet design involves a bit of geometry. It’s about using the entire volume of your closet (I hope bringing up Geometry doesn’t give you sweaty palms and dreaded vision of your Jr. High math teacher!). What makes it difficult (especially in 9’ tall, 24” deep reach in closet) to use this height is most closet doors are 80” tall making it hard with standard shelving depth to use the top. Solving this storage challenge is simple. Using a product called a “reach vertical” you’ll have the advantage of the deeper 14” shelving at the bottom and smaller 12” shelf at the top so lighter (not as frequently used items like pillows, sleeping bags, blankets etc.) can be stored there. 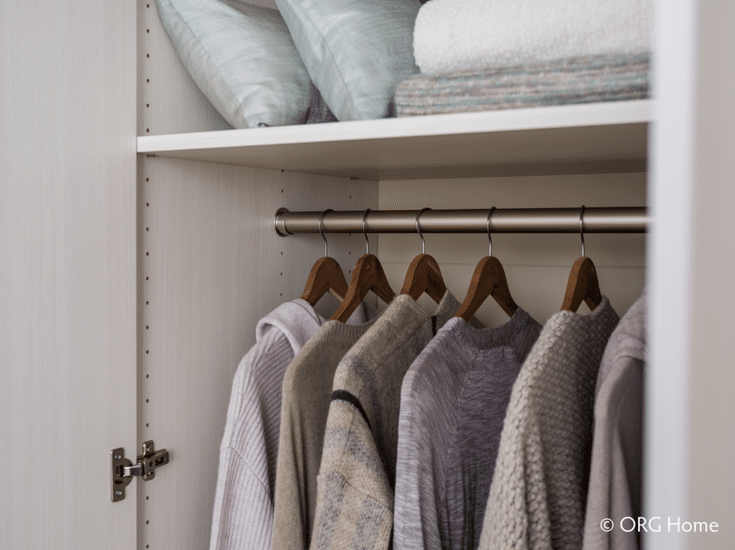 A space efficient custom closet is not a lofty goal which is out of your reach. It all begins with a thoughtful design. This design needs to use all your space, must adjust to your needs and may even test your storage habits to give you the most efficient result. What’s nice is you don’t have to be an expert in closet design, to get an expert closet design. All you need to do is call an expert with 3D design capabilities and you’ll be off and running. For information on a Columbus walk in closet call Innovate Home Org in Columbus at 614-545-6888 or for a Cleveland closet design 216-658-1290. Follow the author on Twitter @Mike_Foti or our companies’ @InnovateBuild and @InnovateHomeOrg. I hadn’t really considered the benefits of not using a trim or toe kick when designing our home closets. You make a really good point about how wall-mounted systems give you much more storage space on the floor. Plus, I imagine that the wall-mounted closet system would work much better for a modern home without too many old-world flourishes. Helou, let me first apologize because of my Englsih. I am coming from Slovenia and also working on walk in closet market. But I din’t understand entierly from your article if you are interior advisor or producer of those presented closets. I would really very much like to receive more infos regarding tops of your closets, since we are making them totally up to the roof of a room.